In January 2015 the Tennant family moved to the Napo region of Ecuador to begin work with Global Orphan Initiative in establishing a children’s home for at-risk and orphaned children. The orphanage will be called “The Oasis” and will include the founding of a church on the property, located in an area that has little or no Christian influence. They will be one of up to six families living on the property and caring for a number of children that will be placed in their home. 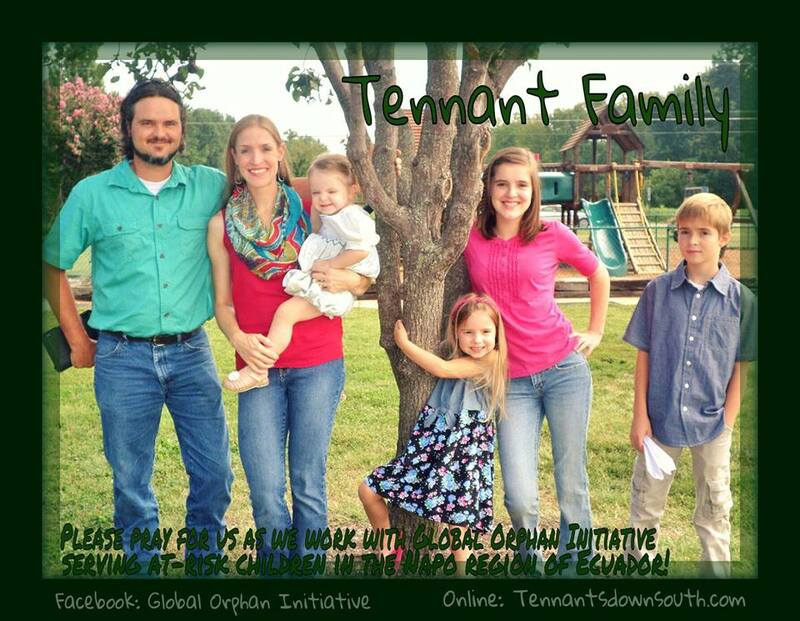 You can find the Tennants on Facebook at “Obligado Por El Amor De Cristo!” or follow their blog at TennantsDownSouth.com. Commit to partnering with the Tennants and their ministry with G.O.I in Ecuador at a minimum of $15 a month. Commit to partnering with the Tennants and their ministry with G.O.I. in Ecuador at a minimum of $25 a month. Give toward the purchase of land and establishing a home.